If you have the passion for cooking or you need great kitchenware for your daily food preparation, you have to read my Rachel Ray cookware review to learn why these utensils are great for your kitchen. Not only do they cook your food uniformly, but these also look great on your rack. These are beautiful pieces of kitchenware that you will surely love. The manufacturers labored to combine quality materials for durability and functionality with style. Great food will become extra special when it is cooked with quality kitchenware. Leave out the taste of chipped Teflon and opt for non-stick pans that do not get scratched easily. Rachel Ray kitchen utensils are made of hard-anodized aluminum that evenly cooks food. These are also very easy to clean. You can get Stainless Steel option as well. Look forward to cooking with your Rachel Ray enamelware and get your kitchenware now. If you are a starting chef or a housewife who loves to cook, you might want extra pieces of quality cookware aside from the basic ones. 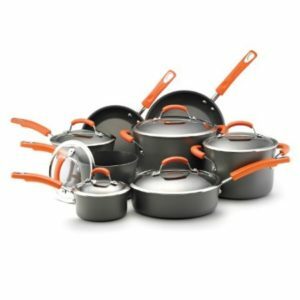 This orange 10-Piece Anodized Set is composed of ten pieces of quality enamelware for great food. Aside from two saucepans (1 ½ qt and 3 qt), a stockpot (6 quarts), a sauté (3-quart) and a skillet (8-inch), it has another 10-inch French skillet. Stop worrying about chipping the Teflon. These pots and pans have a non-stick interior finish for easy cleaning and food release. The hard-anodized aluminum resists scratches and also distributes the heat evenly for uniform food preparation. The 10 piece unit is available with Orange handles (P/N 87375), and Marine Blue handles (P/N 87650). 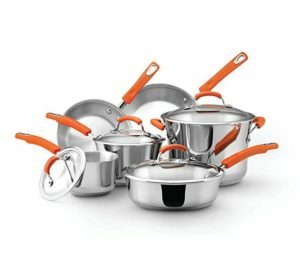 The love for cooking extends to a passion for quality utensils, and that is precisely what the Orange 14-Piece Nonstick Kitchenware Set offers. When your family has a gathering, or it’s the holidays again, and you would be cooking in bulk, this 14-piece set is perfect for such occasions. There are four saucepans of different sizes: 1 2/2, 2, 3, 4 ½ quarts. There is also a large stockpot that can accommodate 6 quarts of your delicious recipes as well as two skillets (8-inch and 10-inch). To complete that is the 4 ½ quart sauté pan. All pans have clear covers. These are all oven-safe for up to 400 degrees Fahrenheit. 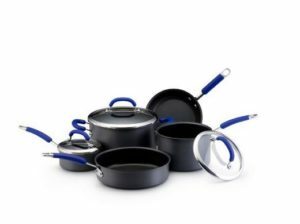 If you are starting out in life and you need an essential pans and pots, this great 8-Piece collection in color blue would be enough for you. It consists of 2 covered saucepans, a 1-qt and a 3-qt, an 8-qt stockpot; an open 3-quart sauté pan and a skillet. The covers are clear tempered glass, so you watch over your food as it simmers or boils. You can now monitor your cooking, and you don’t have to open the pans every few minutes. The handles are made of silicon rubber that stays cool. The secure grips are in the color blue so it will match your blue décor as well. Made from stainless steel, this cooking utensil collection contains a 1.25 Qt. and 2.5 Qt. Covered Saucepans, a 6.5 Qt. Covered Stockpot, a 3 Qt. Covered Saute, an 8.5″ Skillet, a 10″ Skillet and all items are safe for cleaning convenience. These cooking utensils are made with a thick base of aluminum so that heat can be distributed evenly throughout the entire surface. The handles are rubberized to facilitate easy maneuverability and easy handling without causing any damage to the one holding it. Most importantly, to increase the accessibility to monitoring food, the lids are glass made, heat resistant and near transparent. 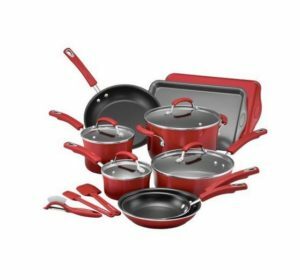 Equipped with grips for handles, the kitchen utensil set contains 16 pieces including 2 saucepans, a stockpot, a sauté pan, 2 cooking pans and 3 skillets covering all essential fields of cooking and baking. Pots and pans are covered with ceramic porcelain enamel. The transparent glass lid is considered shatter resistant, and it locks the moisture inside as well as the heat. The utensil collection also includes a vegetable peeler and a dishwasher-safe spatula made of nylon. As long as the heat is below 350 F, the utensils will be immune to any form of damage in the oven. And, when serving the cooked meal, this set helps present the dish in the most visually attractive way possible. Often people want to know how about the comparison of Rachael Ray and Paula Dean sets. If it is something you also are interested in, drop me a line, and I will have a look. So, even if you are not a huge fan of Rachel Ray’s personality, you will be a big fan of her pans and pots. Enjoy your home cooking with these sets. Meal preparation won’t be this beautiful without this kitchenware. BTW did you know that you can get great deals and prices for Rachel Ray products online? I am reviewing the latest additions to the product lineup, so visit my Rachael Ray cookware review in couple of weeks and learn about newest models!